Trees uprooted when Cyclone Chapala made landfall in Yemen. The Office of the United Nations High Commissioner for Refugees (UNHCR) indicated today that prior to tropical cyclone Chapala making landfall on Yemen last Tuesday, the agency had moved 1,000 tents and 3,000 non-food items kits into a number of governorates to support people in affected areas. “Strong winds, heavy rains and flooding destroyed house, boats and livestock, and disrupted services,” UNHCR spokesperson Andreas Needham told reporters at the regular bi-weekly press briefing in Geneva. “Early reports indicate that around 1,600 families have been displaced in Hadramaut, some 150 in Shabwah, 25 in Al Maharah, and hundreds more on Socotra,” he added, noting that UNHCR is bringing in 5,000 emergency shelter kits to the city of Al Mukalla. Throughout the preparations and response, UNHCR said it has been coordinating with authorities, other UN agencies, non-governmental organizations (NGOs), civil society organizations, and through the sub-national Protection and Shelter Clusters in Aden. Meanwhile, in advance of the cyclone, the Yemeni island of Socotra situated 350km from the mainland in the Arabian Sea, also experienced widespread destruction and displacement, with many taking shelter in caves, schools, or in the homes of relatives. At least 170 houses on the island were fully damaged and a further 610 partially damaged. UNHCR in Yemen reported is has been in contact with colleagues in Somaliland and Puntland to dissuade refugees, asylum-seekers, and migrants – primarily from Ethiopia and Somalia – from taking boats to Yemen due to the dangerous conditions at sea as a result of Chapala. UNHCR has also been informed that a new tropical storm is on its way and may develop in a second cyclone, to reach Socotra on Sunday. Along with other humanitarian agencies, it announced further scaling up of preparedness and response measures. In addition, Mr. Needham said his colleagues in Somalia have once again issued warnings to would-be crossers through partner and community networks. Over the last several months arrivals had shifted primarily to the Arabian Sea coast to avoid intense conflict areas centred in Taiz governorate situated on the Red Sea coast of Yemen. According to the UN, Yemen has 21.1 million persons in need of some form of humanitarian assistance, including access to food, health care and safe drinking water, and over 2.3 million internally displaced persons stemming from the escalation of the conflict since late March of this year. 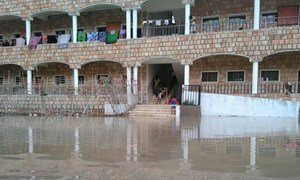 While the United Nations is reporting that Cyclone Chapala – the rare tropical storm that slammed into Yemen’s southern coast yesterday, dumping perhaps a year’s worth of rain in some areas – is expected to weaken to a tropical depression over the next 12 hours, the immediate concern remains the welfare of an estimated 1 million people, mainly in the two governorates of Shabwah and Hadramaut.